One of the most important features of a support group is just that – support. When life gets tough, you might need help in unconventional ways. 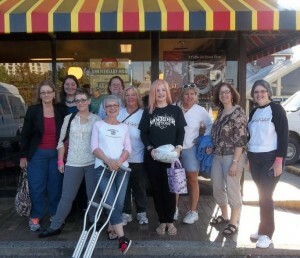 Bariatric surgery support groups are most common in person, usually offered through hospitals and surgeons’ offices. With my hectic schedule and so much of my time spent online, I prefer to participate in an online support group. 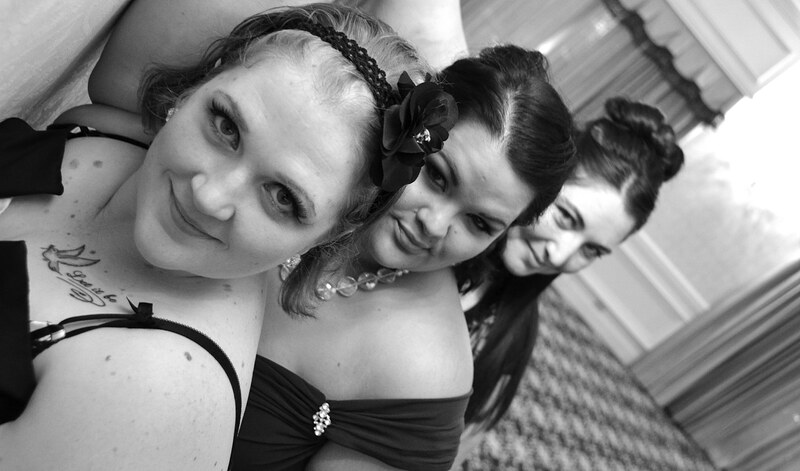 I found the Bariatric Bad Girls Club around the time my surgery was approved, and I’ve come to depend on those friendships daily. One of the dearest friends I’ve made through BBGC is Carla (AKA CC-BBGC). We’ve spent time together several times over the last 2 years, and she has given me encouragement and love when I’ve struggled through tough times. 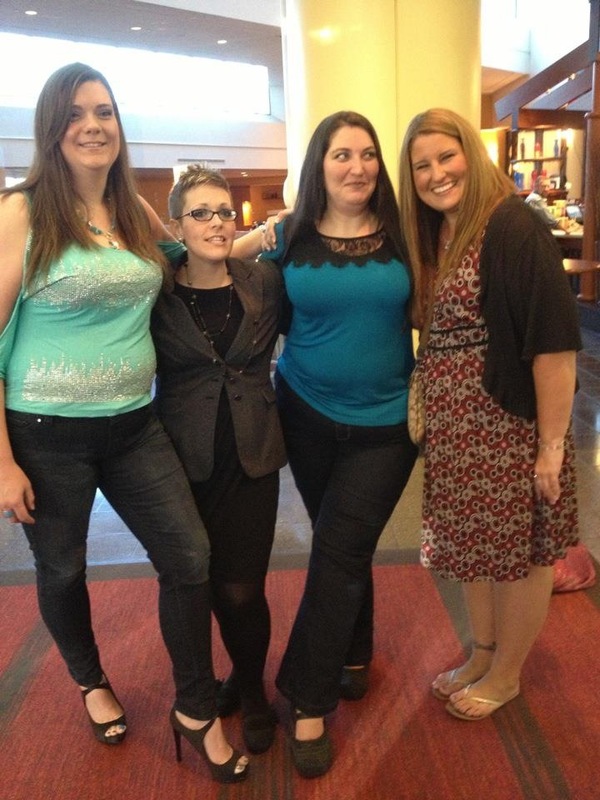 In August, we had plans to room together at the Obesity Action Coalition’s Your Weight Matters conference in Phoenix. 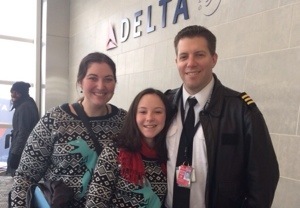 On the flight between Norfolk and Atlanta, her husband Mike had a grand mal seizure on the airplane. After days of diagnosis and treatment, Mike was diagnosed with brain cancer. Their last 4 months have been spent in chemotherapy, radiation, surgery, and various other treatments. 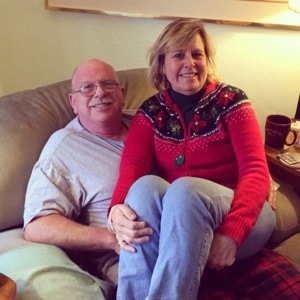 Despite Carla’s infectious happiness and positivity, the stress she has been under to support her husband through the last few months has worn on her. I’ve sent messages of love and friendship, but it didn’t feel like I was doing enough. When my husband was scheduled for a trip over Christmas, Rosie and I had originally planned to spend those days kicking back in pajamas and watching Christmas movies. But on the 23rd, after noticing that Carla’s posts on Facebook were particularly grinchy, I knew I had to do more. After a few travel arrangements, I decided to plan a quick 24 hour trip to Virginia. 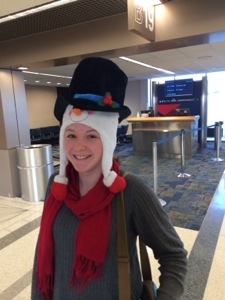 Rosie and I flew out to Norfolk on the morning of Christmas Eve to bring some Christmas cheer. We came decked out in matching Christmas jammies and silly hats. The smile on Carla’s face was priceless when we came out of security and each gave her a giant hug. Carla was wearing a Christmas sweater at the airport in an attempt to be merry, but said that she had to go home and get into her Christmas gear. 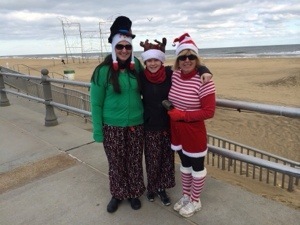 She dressed up as “Carla Claus,” brought Mike along, and we had some fun at Virginia Beach. 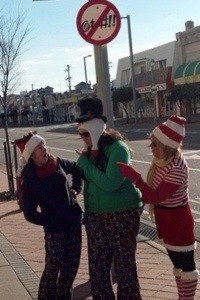 We walked the oceanfront in our silly hats and outfits, talked, laughed, and got some exercise. When Mike was too tired to continue, he waited for us to walk further along the oceanfront. It was fun to see other people smile and comment on our “gay apparel,” and watch Carla briefly forget about the stress that cancer has brought into her life. With all the stress that Mike and Carla have been under recently, it felt so good to help them laugh, smile, and divert their worries away from cancer for a while. We posed for funny pictures in Virginia Beach, particularly by the “anti-profanity” signs (Because in a Navy town, it’s common for everyone to “swear like sailors”). After VB, Rosie said that she wanted to drive to the North Carolina border because she’d never been to NC before. So we hopped on the highway and headed to the border. We stopped at Border Station, which is a convenience store where half is in Virginia, half is in North Carolina, with a huge dividing line through the middle of the store. For dinner, we drove to the marina where Mike and Carla keep their boat. There’s a lovely dockside restaurant called The Lagoon where we enjoyed Christmas Eve dinner. Our mutual friend Vivian, who is also in BBGC, met us at the restaurant to have dinner with us. We laughed, we ate, and had a dinner that was a little unconventional for Christmas. 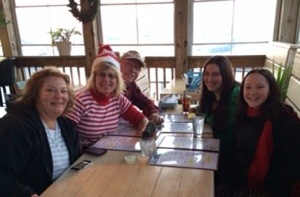 We joked around with the restaurant staff, sang along to the Christmas songs playing over the speakers, and enjoyed the view of the marina as the sun set. When we got back to Carla’s house, we snuggled up on the couch and watched the ridiculously awful B-movie, “Santa Claus Conquers the Martians.” It’s one of those movies that’s so bad, it’s good. We laughed so hard we cried. Carla packed up a suitcase full of sugar-free Torani syrups (our favorite) to send back on the plane to Michigan (totally worth checking a bag). Christmas morning was different than any I’d had before. We didn’t sit around a tree and open presents. We just enjoyed each other’s company as we ate breakfast and watched the parade on tv. Rosie and I had to be back at the airport fairly early to fly back to Detroit, so we said our reluctant goodbyes before 8 am. When Rosie and I got off the plane in Detroit, Taylor was waiting for us at the gate in between his flight legs. We snapped a quick family photo, gave each other a kiss, and he was off on his way. Learn priceless tips on how to amplify the use of social media to help you make lasting connections during and after your conference experience. Nicole will talk about Blogging, Twitter, Facebook, Pinterest, Instagram and food and fitness tracking systems. Discover strategies that will help you connect with others on your journey for support, outreach and accountability. You’ll walk away with a list of actionable tips that you can put to work right away at the Conference and for the long haul of your journey. I’ve been told that my session is sold out, which might be because I’ll be giving out a Nexus 7 tablet in my session. I’m not sure if those not registered will be able to sneak in. You may need to bribe someone at the door. If you can’t make my individual session, I will also be speaking on a post-op panel with Beth Sheldon-Badore, Terry Row, Michelle Vicari, Chris Waffle, and Jessica Stockton. So much of my success I’ve achieved in my weight loss has been through the support I’ve felt online. Many of these online connections have become real-life friends and confidants. To be honest, I feel like a bit of a hack lately for being chosen for this topic. The support and outreach I felt so confident with in the first year of my weight loss experience has waned in the last 6 months (due to some health problems I plan to address in a post in the near future). It’s crazy how when you’re not feeling well, it’s harder to reach out for the support you need (which, consequently, is when you might need it most). Connecting over social media has given me an important link to the weight loss world while I had to take a break from blogging. I’ve decided that it’s okay to take a break, and I’ll be talking about that in my session. It’s not too late to register of ObesityHelp in Anaheim. You can sign up on their website, or register at the door. Tickets are very affordable at $75, and include two days of education, entertainment, food, and fun. Last weekend, I went to Las Vegas for the WLSFA Meet and Greet. 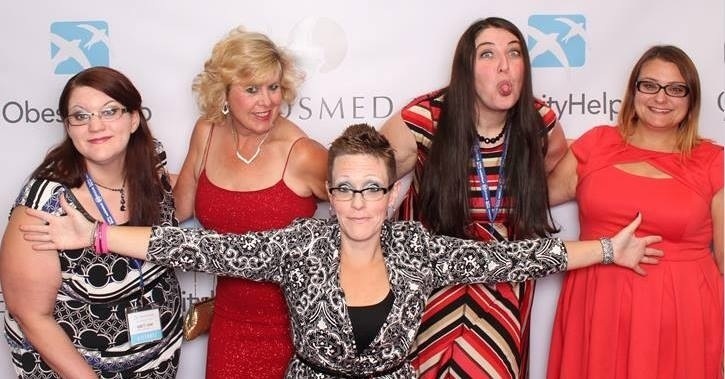 The event was my excuse to get together with a lot of people I love from Bariatric Bad Girls Club, who are from all over the United States, Canada, and beyond. Going to Las Vegas is a mixed bag for me. Because I don’t drink alcohol, gamble, smoke, or raucously party…the appeal of Sin City is low. People tend to overindulge and let loose, and being in Vegas becomes an excuse to behave badly. I arrived at the Las Vegas airport Wednesday afternoon, and my friend Angela picked me up. We had a few hours to kill before more friends arrived, so we went back to Bally’s and Paris. We split a crepe, walked around, did some shopping at Miracle Mile, and recharged. 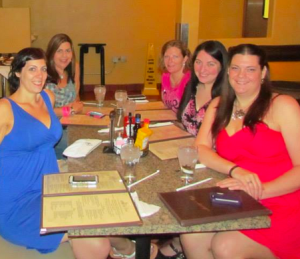 We met a group of friends for dinner at Mon Ami Gabi inParis, which is my favorite restaurant in Las Vegas. 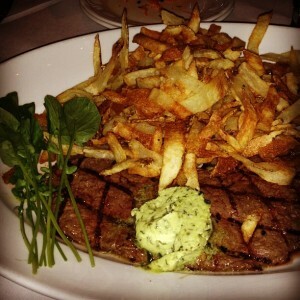 I ordered the steak classique, and it was one of the most delicious steaks I’ve ever eaten. The plate was covered in frites, which didn’t really appeal to me. I wish that I’d gotten the creamed mashed cauliflower…I could have eaten a whole dish of that alone. Next, Angela and I drove back to the airport to pick up Rhiannon, Crystal, and Kara. We had a full car and smiles on our face. I had booked another hotel for the first night to save money, so Crystal and I dropped our bags there and planned to come back after spending time back at Bally’s. 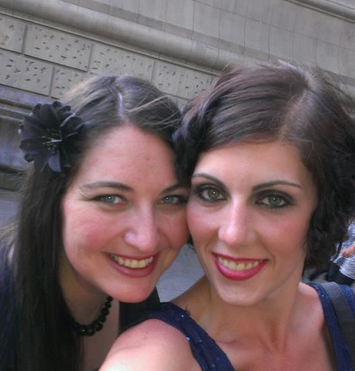 We talked, laughed, snapped photos liberally, and enjoyed being together in person (as opposed to just talking online). But as the night got later, I ended up falling asleep for the night with all my luggage a few blocks away. For breakfast, we left the hotel and went to a diner in a casino off the strip. It’s tough to find an affordable meal in Vegas, and the plentiful buffets do not appeal to weight loss surgery patients (since we can’t get our money’s worth, and it’s a trigger for overeating). If meals are not shared, they are usually just partially eaten. I devoured most of my quiche, but didn’t touch the breakfast potatoes or “fresh” fruit. After breakfast, we went to the grocery store to pick up bottled water, snacks, and foods to put into our in-room fridges. Crystal and I still had our bags in the other hotel, so Angela drove us over to get them. It was funny that the only times we were in the room were to drop the bags off and to pick them up again. Less than 10 minutes total were spent in the room. We went back to Bally’s and were able to score an early checkin. Once we were checked into our room, we slathered on our sunblock, put on our swimsuits, and headed to the pool.Being in swimwear is a daunting thing for anyone, especially those who struggle with their weight, but it was comfortable for me for the first time in a very long time. I was proud of my friends who have lost so much weight and were rocking the bikinis (I’ve yet to wear a two-piece in my life). 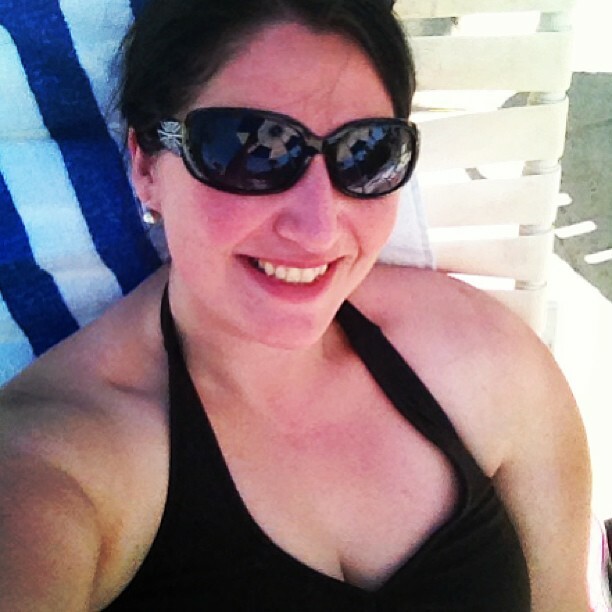 I swam and laid out, and enjoyed being by the pool until I felt my skin start to burn. My fair skin doesn’t last long even with 70 SPF sunblock. My sister Mary and her fiance Shay live in Vegas, and Crystal and I went to Margaritaville with them to celebrate the end of Shay’s finals. It’s a pretty entertaining place to enjoy a meal and the entertainment.We walked around a bit, and snapped some funny pictures. They drove me down the strip to do some shopping for a dress for the Saturday night gala. We returned to Bally’s to meet up with the group and go out to a karaoke bar at Ellis Island. 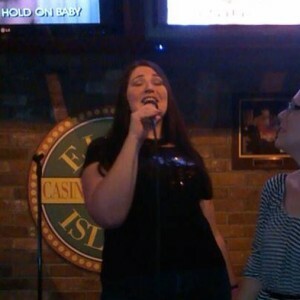 I’ve always loved to sing, and my go-to karaoke song for years has been “Hold On” by Wilson Phillips. It seemed appropriate to sing it with this group since Carnie Wilson was the keynote speaker for Saturday night’s gala. I had so much fun rocking out on stage with friends cheering and singing along. My other partners in crime for karaoke were Kara (singing Abba’s “SOS”) and Carolyn (singing Billy Joel’s “Piano Man). Once we left karaoke, many people went out dancing, but I gladly went to my room to sleep. 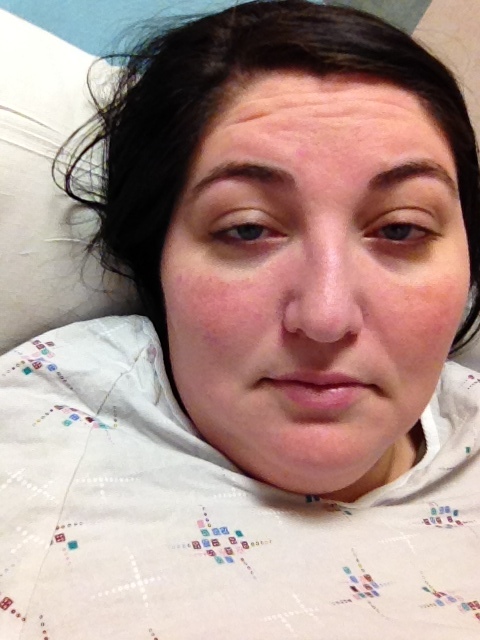 I’ve learned what happens to me when I push myself in Vegas…I end up in the emergency room. Friday morning was a big BBGC group breakfast at the hotel restaurant. It was fun to see more of my friends who had arrived since the day before. Most people split their meals again, except for a few rogue people who went through the buffet line for contraband bacon. We then went to the conference area for registration for the event. 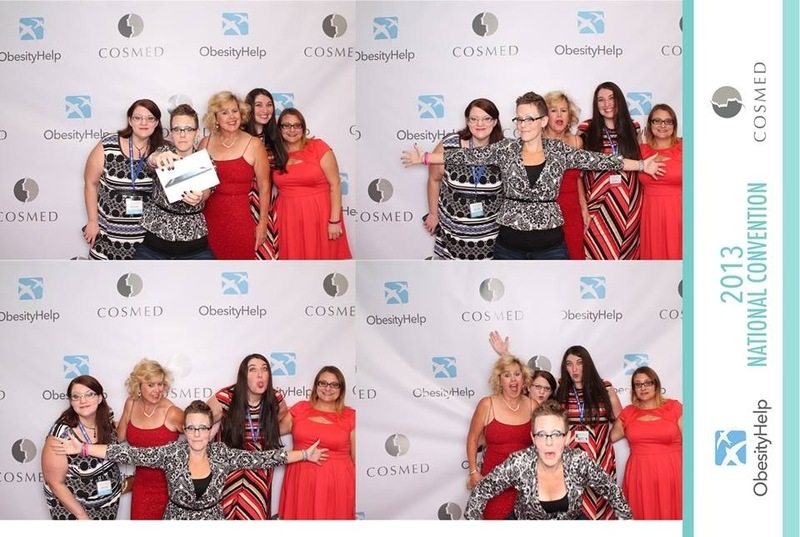 Many people brought before and after weight loss pictures to put on big cardboard stars…and they were posted at the gala. There weren’t any other official conference activities going on until the evening, so I spent another afternoon with friends at the pool. There was a plastic surgeon who set up a cabana for informal consultations for reconstructive surgery (which is very common after extreme weight loss because of excess skin). We stayed outside for a few hours, then I moved into full shade – I have a tendency to burn, and didn’t want to resemble a tomato. I took a power nap in my room before getting ready for the opening party for the conference – A Night in Paris. The BBGC group met by the Eiffel Tower outside of Paris to take a group picture, but I arrived just late enough to miss it. Luckily, lots of fun candid shots were taken. The official party was a little…disorganized. We were told a time that the event would begin, but we had to stay out in the lobby for a good half hour. Once they started letting people in, the food was gone within ten minutes. For a group of bariatric patients, the food choices were not ideal – especially baskets of bread and raw veggies. The location for next year’s event was announced, there was a presentation about the WLSFA grant recipients, and then there was a variety show. I stayed for a few acts (where Jeris totally knocked her vocal performance out of the park) and then left with friends to do my own thing for the evening. Saturday morning was when I felt like the actual conference started. I talked with some great vendors in the Expo hall, including Celebrate Vitamins, Wellesse, Slimpressions, Big Train, and many more. I attended several sessions, my favorite being by Dr. Yoni Freedhoff about the fallacies of dieting and why so many people fail on “diets.” (For a great recap of that session, read the post on Fatty Fights Back). I attended most of the sessions, had some fun in the photobooth with Beth and Eggy, and then spend a little time at the pool. 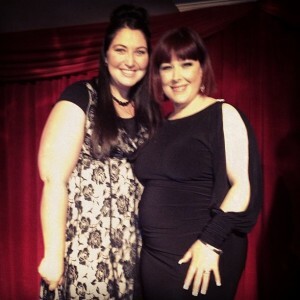 Saturday night was the big gala event with Carnie Wilson. After seeing how fancy everyone was dressed, I was glad that Crystal talked me into getting another dress. We did lots of posing and photo ops, and enjoyed being all dolled up. 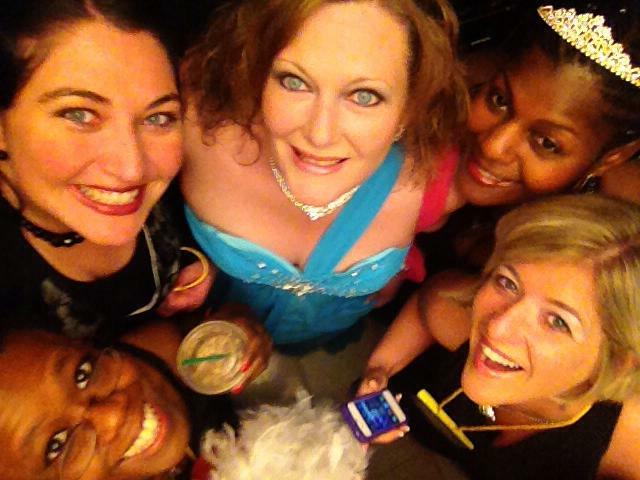 There was a “bling off” beauty pageant where we cheered for the ladies and gents most dazzled up for the night. 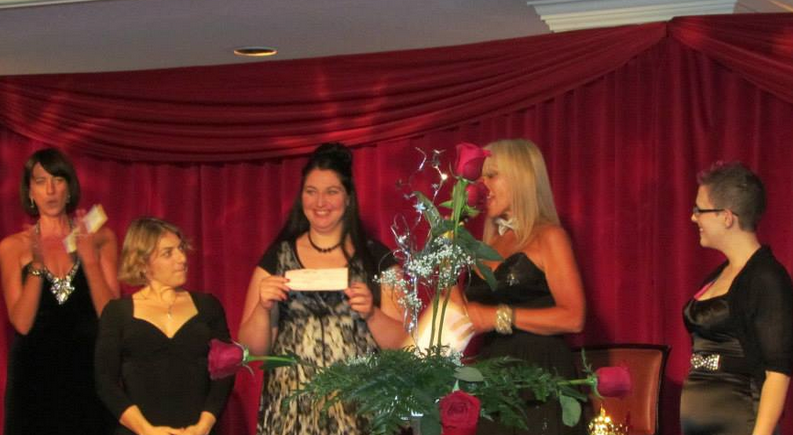 The Bariatric Bad Girls Club raised money to donate to the WLSFA to help pay for grants for weight loss surgery patients. I was excited when Beth and Michelle asked me to come up to the stage to present the check with them, and they asked me to announce the donation. I announced the Bariatric Bad Girls Club with pride, and asked for all of the members to please stand up. There was wild applause and cheering as I handed the check over. It was the most exciting moment of the conference yet. Imagine my surprise when the WLSFA later rejected the donation…for reasons that are still somewhat unclear to me. It felt like a slap in the face to many people. 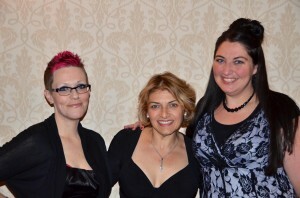 Beth wrote more about the voided donation on her blog, if you’re curious about the details. But let’s skip back to the gala when I was still on cloud 9. Finally, it was time to hear from Carnie Wilson. Carnie has been a person I’ve looked up to since I started listening to my first Wilson Phillips cassette tape. I related to her because I loved to sing, but I always felt like I was put in the background because I was the biggest girl. I’ve watched her public struggles with her weight, and have always appreciated her honesty and candor. Her address at the WLSFA was no different. She kicked off her uncomfortable shoes, and talked to us like friends. She revealed her history…struggles, addictions, triumphs, and heartache. She inspired me to make some changes in my personal life on habits that could become destructive to me in the future. And wow….I laughed so much. I was one of the lucky 20 people randomly selected to meet Carnie in person. As I walked up to her, she said “You have the most gorgeous hair! I can’t get over how pretty it is! You’ve gotta tell me your regimen!” We had about 2 minutes to chat, hug, and pose for some pictures. There are some people you meet in life that just radiate warmth. For me, Carnie was one of those people. I felt like she was 100% authentic and cared about me. She even followed me on Twitter later that night. Sunday was a pretty chill day for me. People checked out of their hotels, had their last meals together, and many flew home. I was certain that I purchased a return flight for Sunday night, but somehow booked myself for 6:00 am Monday morning. When I found out that my friend Kara had been stranded at the airport after delayed and canceled flights, I decided to rent a car and rescue her. We got some lunch, and went to her comped room at South Point. I met up with a group of friends for dinner at Harley Davidson, and then took Crystal to the airport. I had one last visit with Mary and Shay, and headed back to South Point with Kara. Coming home from Vegas was difficult because it required a 3:45 am wake-up, returning the rental car, and getting to the airport. Then, I went straight to work for the day, physically exhausted but emotionally satisfied. 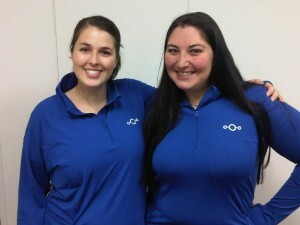 Online support has been vital for my weight loss success, but it’s the connections I can nurture in person that make such a difference. While I left the event feeling like I would no longer attend WLSFA events, I am glad that I attended this conference if only to see my friends. I have found who I can rely on for support, and met people who have been inspired by me. 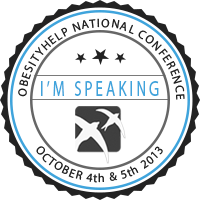 Oh, and if you want to know which weight loss surgery events are on my calendar…I will be attending the Obesity Action Coalition‘s Convention in Phoenix this summer, as well as speaking at FitBloggin in June and ObesityHelp in October. My, my, my. It’s been a busy few weeks. I’ve had so much going on that I’ve hardly had a chance to do anything blog-related. So consider this my catch-up post. I know it’s April Fools Day, but no jokes in this post! My Trip to Virginia: My friend Robin from BBGC hosted a party in Virginia, and as soon as I knew it was happening…I had to go. Standby flights worked out in my favor, and I got to spend last weekend with some of my favorite ladies in the WLS community. 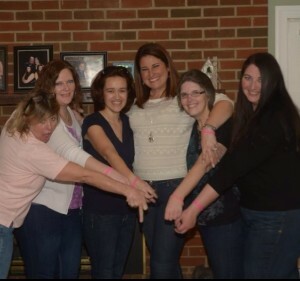 In this pic: Carla, Crystal, Nicole, Suzanne, Robin, and me….all sporting our pink BBGC bracelets. I’ve spent so much time talking online with these ladies, and only have seen them in person one other time in Atlanta for the Obesity Help event. I feel so much sisterhood with Bad Girls, and I wish I could spend so much more time with them in person. I’m really looking forward to the WLSFA Meet and Greet in May, as well as the Obesity Action Coalition conference in August. Reactive Hypoglycemia Update: After 2 months of waiting, I finally got in for my endocrinology appointment at the Utah Diabetes Center. The doctor reviewed my symptoms, food and exercise diaries, and agreed the best thing to do for now is to monitor my blood glucose levels. I got my DIABEETUS testing supplies and it’s been nice to have better marker of my blood sugar levels than just symptoms alone. 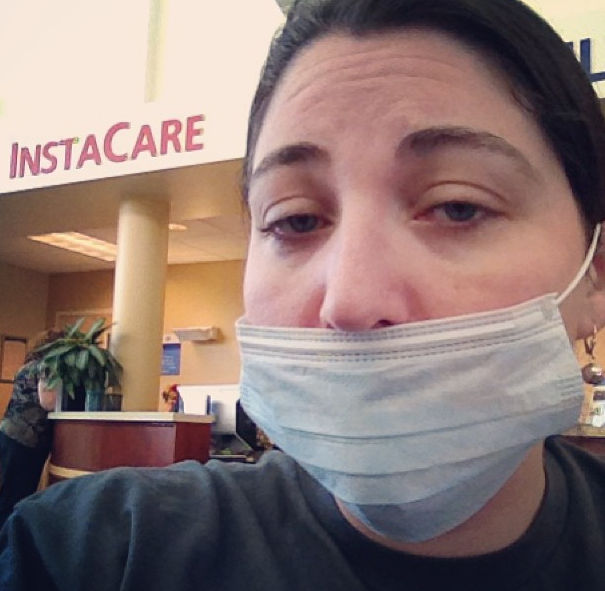 Bronchitis: I’ve been out of commission with bronchitis for a few days, but I’m starting to be on the mend. I had 10 days of minor symptoms that eventually culminated in pure misery and a visit to Instacare. I’m on day 3 of antibiotics, and spent the majority of Easter weekend asleep in bed. I’m hoping to be feeling good enough to travel to California this week for some time with family and the Social Media Managers World Conference in San Diego next weekend. 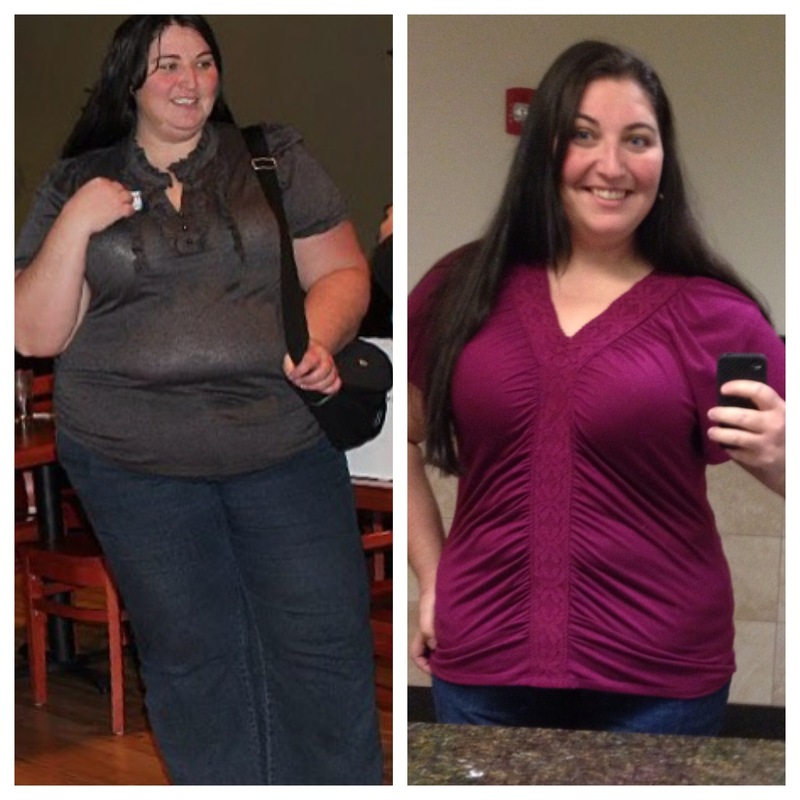 The 2013 WLS Awards: Today I found out that I was chosen as the “favorite WLS newbie” in DivaTaunia’s Weight Loss Surgery awards. Thank you to all who voted for me…I’m happy that you have been inspired by me (and felt inclined to vote). 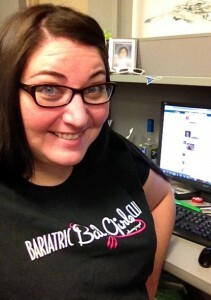 Check out the podcast to see which other nominees are rocking the bariatric world. Swimsuit Season: The weather is warming up, and it’s time to find a swimsuit. For the first time in my life, I’ve actually tried on some 2-piece tankinis. I’m still looking for the right suit, but I’m excited to have SO MANY more options than I did in years past. April is going to be a busy month, but I’ll try to post on my blog as often as I can. I’ve been trying to test out traveling with and without my laptop. It’s a lot easier to ditch the laptop and bring one less bag with me on the plane…but I can’t do everything I want to on my iPad. After I get back from San Diego, I leave for Type-A Advanced in Philadelphia, where I’ll be speaking on one of the expert panels. Then I’ve got WLSFA in Vegas in May, and FitBloggin’ in Portland in June. My friend Jennifer from Bariatric Bad Girls Club wrote a funny weight loss surgery version of The Twelve Days of Christmas. She shared the link from her blog in BBGC, and it had me in stitches. Oh, how I relate to this, especially this year since it’s my first Christmas since surgery. On the 1st Day of Christmas, my surgeon gave to me, a Roux-n-y Surgery! On the 2nd Day of Christmas, my surgeon gave to me, two weeks of protein shakes. On the 3rd Day of Christmas, my surgeon gave to me, three French Vanilla Protein bars. 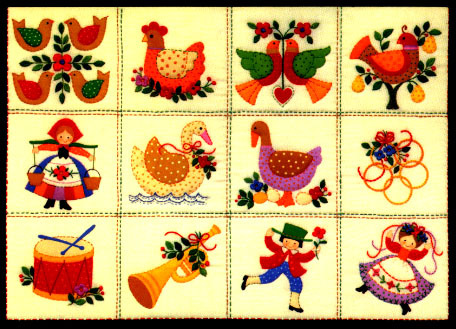 On the 4th Day of Christmas, my surgeon gave to me, four follow-up visits. On the 5th Day of Christmas, my surgeon gave to me, five little incisions! On the 6th Day of Christmas, my surgeon gave to me, six weeks of soft foods. On the 7th Day of Christmas, my surgeon gave to me, seven laps of swimming. On the 8th Day of Christmas, my surgeon gave to me, eight glasses of water. On the 9th Day of Christmas, my surgeon gave to me, nine little bites. 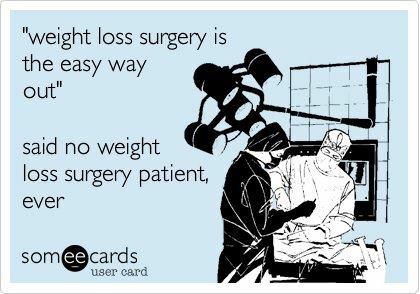 On the 10th Day of Christmas, my surgeon gave to me, ten clothes sizes. On the 11th Day of Christmas, my surgeon gave to me, eleven kinds of beans. On the 12th Day of Christmas, my surgeon gave to me, the tools to succeed! Last month, I attended the 2012 Obesity Help Conference in Atlanta (hashtag #OHAtlanta). Even though I’m not active in the Obesity Help support forums, I was happy that they were hosting an event. A lot of my friends from Bariatric Bad Girls Club were attending, which was enough motivation I needed to buy a ticket. Because I was flying out to Atlanta on standby, I wasn’t exactly sure when I’d be arriving. I had my hotel room at the Hilton booked for Friday and Saturday night, but I ended up getting out on Thursday. And by getting out, I mean that I took the scenic route. I missed the direct flight to Atlanta by about 5 minutes because the stupid security line at SLC was longer than I’d ever seen it. Rather than waiting 5 hours for the next direct flight, I connected in Tulsa, and got to Atlanta Thursday evening. I tried to connect with the other BBGC ladies throughout my travels, but I couldn’t find anyone who had an empty bed in their room. I found an inexpensive (aka ghetto) hotel that was a few blocks from the Hilton, which was convenient for our breakfast plans in the morning. In the morning, I hauled my luggage down Virginia Avenue toward the conference. I was flagged down by a bunch of friendly people thinking I was mistakenly trying to walk to the Atlanta airport (which is close, but not within walking distance). I got to the Hilton, and immediately saw my BBGC ladies. And where did we decide on for breakfast during an obesity conference in the South? 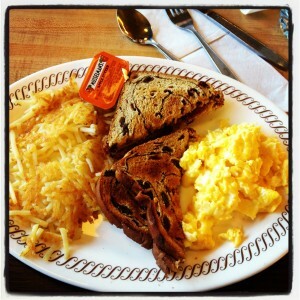 Yup, Waffle House. Let’s just say a few people in the group got very tummysick and regretted the meal. I got the cheese ‘n eggs and was spared from getting myself too ill. When we got back to the hotel, we went to the clothing exchange in one of the conference rooms. It was nice to be able to get some “new” clothes in smaller sizes. Between what I got in the exchange, and from Robin from BBGC, my suitcase was totally full when I came home. There were lots of classes each day. Some were panel discussions, others were intensive courses about everything from plastic surgery to diet plans. 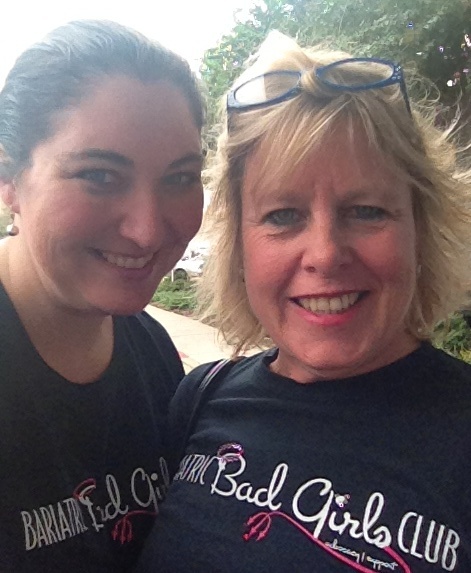 Beth (aka Melting Mama) is the fearless leader of the BBGC, and was on the best panel discussion that I attended. She is excellent at bringing up difficult topics and discussing the hard realities of life after weight loss surgery. A lot of people don’t realize that weight loss surgery makes you more prone to alcoholism. When the food that you’ve relied on your whole life suddenly loses it’s appeal, transfer addictions happen. The discussions that happened about transfer addictions at the conference were very enlightening. 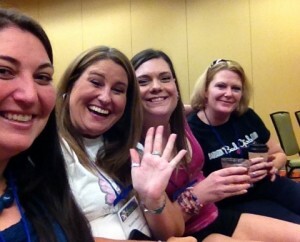 One of the most wonderful things about OHAtlanta was the creation of “The Fab Four.” Suzanne, Angela, Crystal and I were naturally drawn to each other during the first day of the conference, and we were inseparable until we all left to go home. We sat with each other in classes, ate our meals together, chatted over drinks, and bonded like sisters. Although I connected with almost all of the BBGC’s in Atlanta, the Fab Four is the best thing that came out of the conference for me. We talk daily over a group instant messenger, and discuss food, clothes, relationships, non-scale victories, and our inappropriate senses of humor. 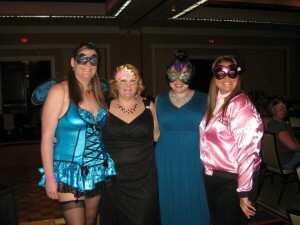 On Saturday night, there was a weight loss fashion show and masquerade ball. It was so fun to see the men and women in the fashion show who have had success and have gained confidence. So many smiles from the participants and cheers from the audience. After the fashion show, people donned their masks for the masquerade ball. Because it was in October, some people went with pretty dresses and masks, others went in Halloween costumes. I went with a dress that I really like and feel cute and confident in. But part of me wishes that I’d gotten in on the group costume. 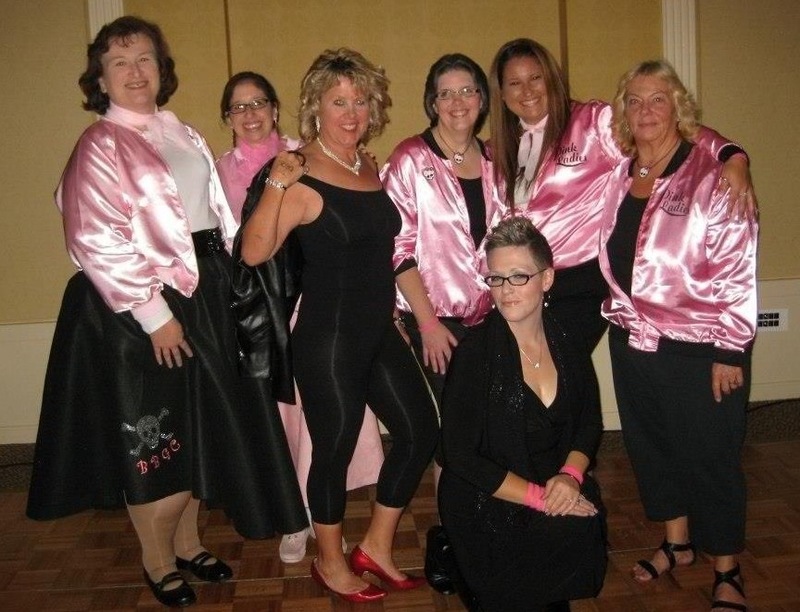 Because black and pink are the colors of BBGC, a bunch of the ladies decided to go as the Pink Ladies from Grease, complete with Beth in her fashion show attire and Carla as “slutty Sandy” wearing her Slimpressions and red heels. I’m not in the Pink Ladies pic, but look how cute they are! Besides the official conference events, we had a blast going through the vendor booths. There were some great vitamin, protein, and weight loss surgery-friendly products for sale. I skipped on the fizzy tablet that turns into vitamin jello, but I did buy my first Slimpressions. I feel so blessed and fortunate to be a part of such a wonderful group of ladies (and a few token gents). It’s not just a support group for me. They are my virtual family. Because they’ve gone through a lot of the same struggles in life, we’re bonded. We rely on each other when times are tough, answer questions that we may have been misinformed on, and get our daily vitamin reminders from Toni. I met quite a few of the BBGCs briefly in May when I stopped by the WLSFA meet and greet on my way down to Cali for a wedding, but I didn’t get to bond with many people. After spending adequate time with my ladies in Atlanta, I can’t imagine my daily life without their support and humor. There is a lot of love in BBGC…just ask Carla who gave the most epic kiss of the weekend. I went to quite a few conferences this year, and I had the most fun at OHAtlanta, hands down. 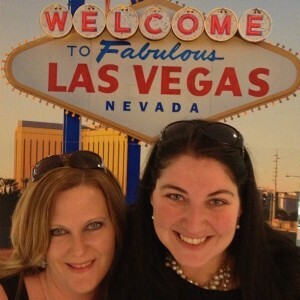 If you’re interested in attending a future weight loss surgery event with the Bariatric Bad Girls, the next one will be the Las Vegas WLSFA Meet and Greet in May. I’ll be there with bells on. Losing 50 pounds was my first big goal in my weight loss journey, and I achieved it with pretty consistent weight loss. But once I hit 50, I had my first plateau. I even gained 2 pounds! *Gasp! * I blame part of it on travel…I’ve been traveling like a maniac the last few weeks. First we went to southern California for Easter weekend to stay at my in-law’s beach condo in Ventura County. Last weekend I joined my husband on a long layover in Dallas. Let me tell you – it’s HARD to eat the way you need to when you’re traveling, especially airline travel. I can’t take the foods I would like to pack through airport security, and the stores within the airports don’t sell them. I was subjected to taking protein powder for shakes, nuts, and other dry items. Also when traveling, I tend to eat out at a lot of restaurants. I typically share a meal (or even a kid’s meal) with my husband or daughter. Those are my most likely reasons for the weight gain and plateau. The good news is that I got right back on track as soon as I got home on Sunday, and I was pleasantly surprised that the scale showed I not only lost the 2 pounds I’d gained, but I was down a bit more. I weighed in at 318.5, which is a total of 54.8 pounds lost. Another good thing about traveling is that I’m much more physically active than usual. Between walking down airport concourses, sightseeing and shopping, my stamina seems to last a lot longer. With all of the flight bumps and cancellations coming back from Dallas, I’m sure I walked at least 3 miles in airports on Sunday. 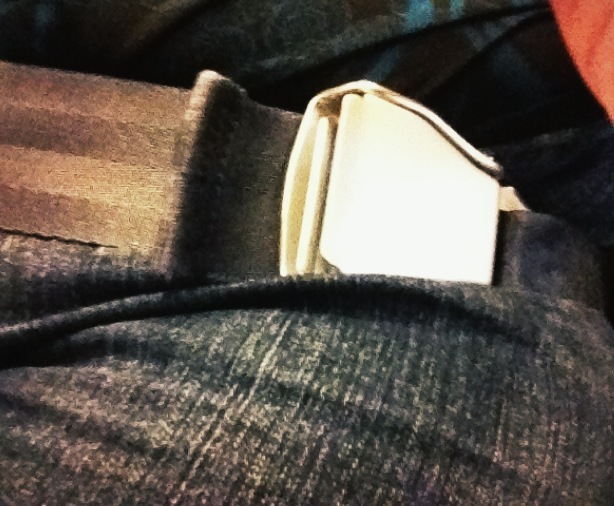 A happy non-scale victory I did have while traveling was being able to fasten the airplane seatbelt without an extender. This is a HUGE victory for me, because I do travel so much and I have felt so much shame in asking a flight attendant for an extender. I also could put my tray table down about 95% of the way (which before I’d just avoid it because it was nowhere near flat). When I travel with my husband or daughter, I often put the airplane armrest up so it’s not digging into my thighs. This time I tried to put down the armrests…they’re not as bad as before, but I think they will soon be a problem of the past. This week I’m amping up my physical activity so I can be ready for the Color Me Rad 5k on the 28th. I probably could use some new running shoes, but I don’t want them to get all gross and stained from the rainbow powder. I’ve been sticking closer to my diet guidelines and avoiding eating out this week. Lately I’ve had a daily craving for tomato soup, so I get my comfort food fix that way. Today I was sedated with Propofol, the drug that killed Michael Jackson. After the procedure, the PA said to avoid moonwalking for the rest of the day. As I’ve mentioned in several other posts, I’ve been having a difficult time with keeping liquids and solids down the last 10 days. I’ve been having some pretty violent vomiting, which can cause scarring on my surgical anastamosis (where the stomach pouch and small intestine come together.) 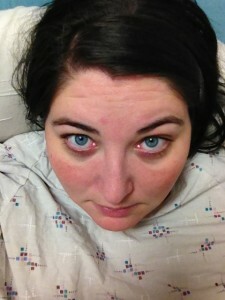 At my 4-week post-op visit, Dr Smith told me that I probably had a stricture, and would need to have an endoscopy to see if I needed to be dilated. Unfortunately, the soonest I could get an appointment was Thursday (today), so I’ve had a tough few days. Monday night I was in the ER to get hydrated, and I’ve still been having a tough time getting enough fluids. This morning I had to be at St. Marks at 7:30am for registration. Once all the paperwork was order, I was taken into endoscopy. I got in my gown, was hooked up to IV fluids and monitors, and had an EKG. I was asked the most comprehensive health history questionnaire imaginable. I’m allergic to fentanyl, which is commonly used in endoscopic procedures, so they said they would be using a different drug on me. 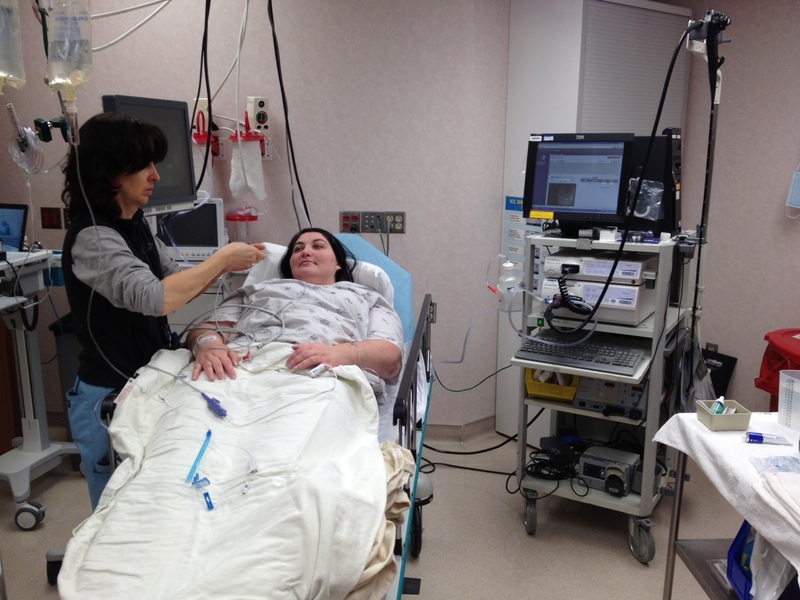 Once all the pre-procedure stuff was taken care of, the took me into the endoscopy procedure room. They put me on oxygen by nasal cannula, and the tech told me about the functions of the endoscope. The actual scope was smaller than I expected, much to my relief. Within the black cable (which is hanging down in the from the machine on the right), there are functions to insufflate (blow air) and suction, as well as the camera. They called Dr. Simper (one of Dr. Smith’s colleagues), who would be giving me the procedure. He reviewed all the risks and benefits of the procedures, then I signed consent forms. 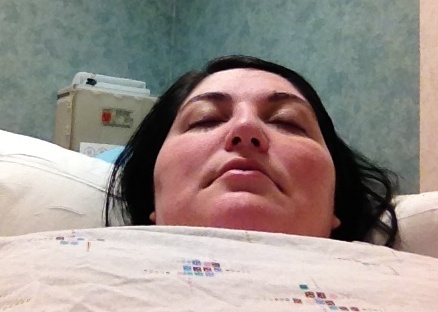 They started an IV push of Propofol, and everything got fuzzy until I fell asleep. The procedure took less than a half hour. The endoscopy showed that I indeed had a stricture. A normal anastamosis is supposed to be 10-15mm. Mine was 4.5mm. This is like the difference between the diameter of a dime versus a pencil. No wonder I had such a hard time keeping things down! They successfully dilated me, and said I should be having immediate relief. I was given some apple juice with Sprite to drink, so they could see if I could keep it down. I was excited that I was able to drink and keep the drink down without discomfort. After finishing more IV fluids, they released me. I spent most of the day sleeping, which wasn’t hard because I was still so groggy from the sedation. I sipped on broth and juice, and had some sugar-free popcicles. After being on clear liquids so much this week, I’m VERY excited to go back to soft foods tomorrow. Bring on the cottage cheese and yogurt! But enough about Michael Jackson, endoscopic procedures, and liquid diets…how about The Ramones?